Measure the elastic around your head leaving an inch overlap. Line up the velcro with the elastic and cut a one inch piece. Cut the velcro so that it fits the size of your elastic. Glue the velcro to the end of elastic. Repeat the last two steps using the other side of the velcro. Make sure the velcro is glued on the other end, AND opposite side of the elastic. Cutting as close to the flower as possible remove any stems and backings. Place the cardboard or scrap fabric down. Line up your flowers on the elastic. 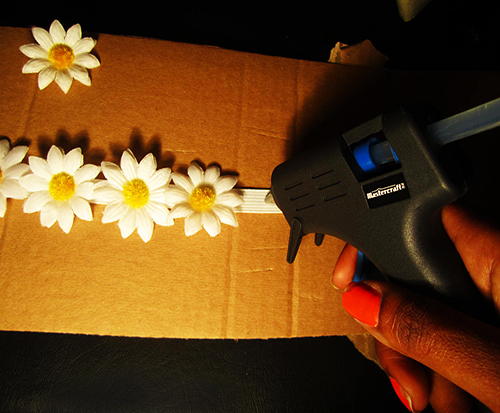 Individually glue each flower to the elastic. I later decided to remove the center from every other flower. This entry was posted in DIY and tagged accessories, Crafts, Flowers, Headpiece, Summer by Think Outside The Cloth. Bookmark the permalink. Super cute! I have to try this one day! Yea it’s a pretty easy DIY.